Each year the Oregon Dairy Women present an Appreciation Award to an outstanding individual or business who has been especially helpful to the dairy industry. 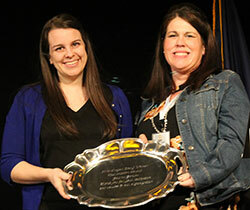 The award is presented at the Oregon Dairy Farmers Annual Convention. © 2019 Oregon Dairy Women All Rights Reserved.